Where else has cheap eggs? Easter is a little over a month away, and Aldi is prepared with some great Easter bargains, including a huge range of Easter eggs and Easter bunnies. If you’re looking for a real show stopper this Easter, treat yourself to Aldi’s award winning Specially Selected Exquisite Hot Air Balloon Easter Egg, £12.99, it’s almost too good to eat! 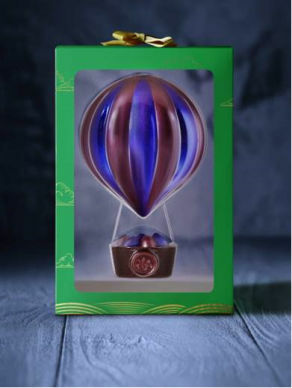 Exclusively hand-decorated for Aldi by an expert team of British artisan chocolatiers, this stunning rose gold and purple hot air balloon egg is made with the finest milk chocolate and contains sparkling wine and gin & elderflower mini eggs in a hand crafted basket. The egg is inspired by the Artisan du Chocolat premium egg from Selfridges- but is half the price! Another luxury egg is Aldi’s Specially Selected Exquisite Imperial Egg, £8.99. This is inspired by the ornamental Faberge style eggs, and is as stunning as it is delicious. 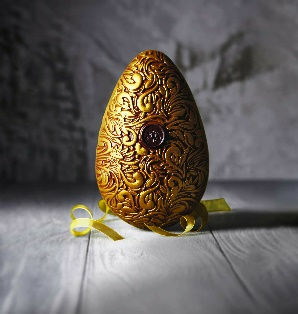 The egg is intricately engraved and hand decorated with gold lustre and finished with a dark chocolate seal. 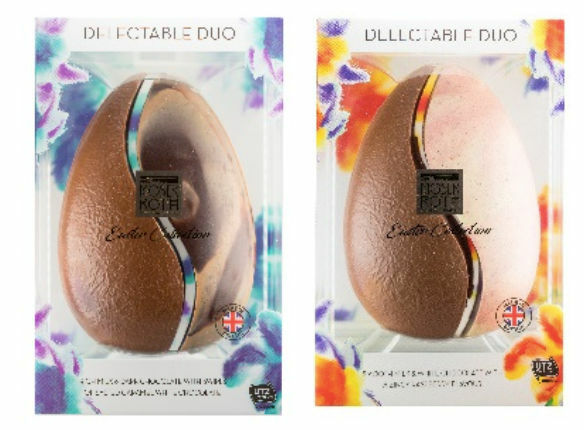 Enjoy two sides to your Easter with the Moser Roth Delectable Duo, £4.99, which is an elegant half and half chocolate egg. One is milk and white chocolate with a raspberry flavouring, and the other with milk and dark chocolate with salted caramel. Aldi’s delicious Fair Trade Single Origin Easter eggs, £4.99, are available in Peruvian dark chocolate and Ghanaian milk chocolate, and are beautifully printed with eye-catching animal designs. For extra indulgence, pick up one of the Moser Roth Truffle Tins for £4.99, which are filled with individually wrapped truffles in champagne or salted caramel flavours. For a creative and fun twist, check out the Curious Inventions Easter Egg, £2.99, perfect for a big kid this Easter. Choose from a milk chocolate egg infused with Popping Candy, Rocky Road, or a new addition, Honeycomb. 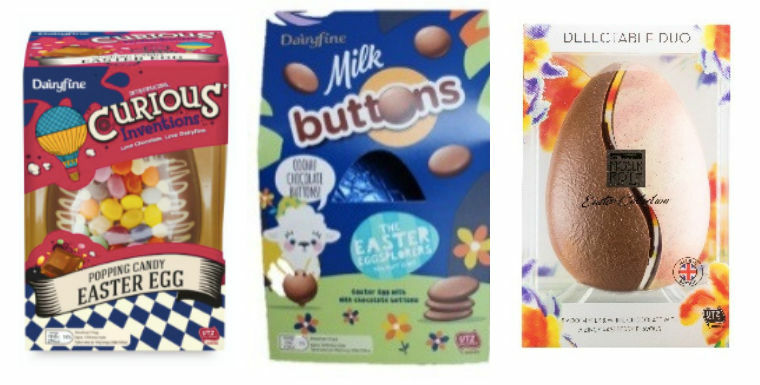 If you’re after something a bit smaller, there’s Dairyfine’s Milk Chocolate Easter eggs, which are just 65p, and come with buttons or mini eggs. Aldi also has a dairy free egg, Moo Free Easter Egg, for £3.49. These eggs are as good as the real deal, and are available in honeycomb, orange, or classic chocolate. If you’re after a bunny instead of an egg, Aldi have a giant chocolate Easter bunny, made with delicious milk chocolate and decorated with white and dark chocolate, for £3.99. For an alternative to Lindt’s famous Easter bunnies, Aldi has foil wrapped Choceur Chocolate Bunnies in milk, white, or dark chocolate, and at 79p they’re a fraction of the price! Where else can you get cheap Easter eggs? Tesco currently has a great deal where you can buy two Easter eggs and get two free, and it applies to all the medium-sized eggs in stores. The deal only lasts another week, until the 27th February, so get in quick before they’re all gone. Poundland is selling giant Kinder surprise Easter eggs for £2, which are normally £5, or you could try and make your own like these mums did. If you’re on the hunt for one of Cadbury’s White Creme Eggs, make sure you check out our hack on how to find one.